This ergonomically designed, hand-held massager comes with 5 attachments - facial, deep muscle, general body, accupoint and raised bump attachments - to customize your massage experience. This massager has 2 speed settings so you can adjust it as per your requirement. It is powered by two AA batteries, making it portable. Deep muscle - delivers ripple effect action for large muscle areas. Accupoint - lets you apply deep, pinpoint massage action to a targeted area. Raised Bump - reaches deep to comfort tired muscles. All Purpose - for general all over body massage. Facial Sponge - for gently massaging delicate facial areas. 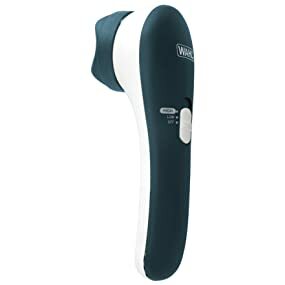 The Wahl Spot Therapy Massager provides a soothing, relaxing massage and comforts tired muscles. Running on just 2 AA batteries, this compact massager is ideal for use at both home and for keeping with you to use whenever you need. The ergonomic design makes it easy and comfortable to handle and the five different massage attachments can be easily interchanged.